We’d love your help. 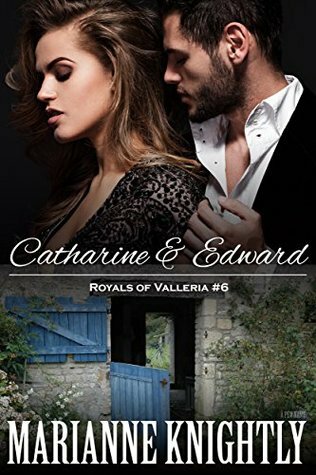 Let us know what’s wrong with this preview of Catharine & Edward by Marianne Knightly. A princess holding the fate of the monarchy in her hands. A bodyguard challenging her royal duty for love. Princess Catharine, second in line to Valleria’s throne after her elder twin brother, has been indulged her whole life. A surprise at birth, her parents have doted upon her – until now. Her mother has issued a queen’s edict: become engaged by the time of her elder bro A princess holding the fate of the monarchy in her hands. Princess Catharine, second in line to Valleria’s throne after her elder twin brother, has been indulged her whole life. A surprise at birth, her parents have doted upon her – until now. Her mother has issued a queen’s edict: become engaged by the time of her elder brother’s wedding – or else. Philip, a Vallerian noble if ever there was one, could be the perfect fiancé, or a perfect fake one, in any case. Cat could easily pretend to fawn over the handsome man and fool her mother and the press. At least, she could if she wasn’t falling for her bodyguard and Royal Protection agent, Edward Bashiera. One heated kiss between them at the Holiday Ball is hard to forget, and even harder when she learns more about the man underneath the venerable veneer. When circumstances change, and suddenly Catharine must ensure the family legacy, can she put aside a growing love for duty? And, when a terrible deception comes to light, will Edward be able to protect Cat when she needs it most? Meet the Royals of Valleria, a country as old as the fall of the Roman Empire. The reigning king and patriarch rules with his beloved queen. Nine children, now grown, ranging from the eldest twins to the youngest son, watch over the country they love and care for. Bound by honor, duty, and each other, follow their lives as they fall in love, face tragedies, and triumph against the evils facing them. To ask other readers questions about Catharine & Edward, please sign up. I love how the books show what can happen being royalty. I love that the author shows that royalty can have drama in their lives like every normal person but theirs might have more than that everyone has seen. I just finished reading this book and it was awesome from beginning to end! I can't wait to read the next book in this series. This book has my all my fav trope. I loved, loved it. Looking forward to this book. I am in love with this royal family. Cat and Edwards story wasnt as intense and passionate as most the others. but i enjoyed it nonetheless. Bodyguard and Princess, slightly clique. Looking forward to the wedding. So good to see Cat falling in love especially with her bodyguard although it came rather abruptly. So many of the stories have centered around security. It seems only fitting.